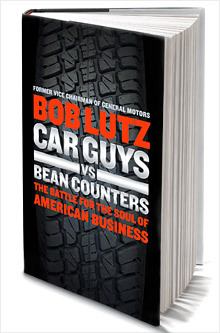 I just finished the audiobook version of Bob Lutz's new book, "Car Guys vs Bean Counters - the Battle for the Soul of American Business." I liked it. I learned a lot about the automotive industry. I see a lot of similarities with other industries. Early in the book Lutz described the systemic problems at GM in words that resonated with me, since I've seen the same thing in other companies. He said they were fostering a culture of corporate infallibility and self-worship. And that their goal in product design and development was "perfecting mediocrity." Their focus had been on making profit numbers, and not on producing quality vehicles. By intentionally not designing high quality (and slightly more expensive) cars, the bean counters were treating the customers as hapless victims, in order to ensure profits down stream (replacement parts). They were driven to reduce costs, skimp on service, and ruthlessly pursue quarterly profits. The book also includes an interesting history of how the Chevy Volt came about. I don't agree with everything Bob says. And you probably won't either. But it's still an interesting book. I think this is a great read for any senior manager in any industry. Here is the CNN/Money review and the BusinessWeek review.